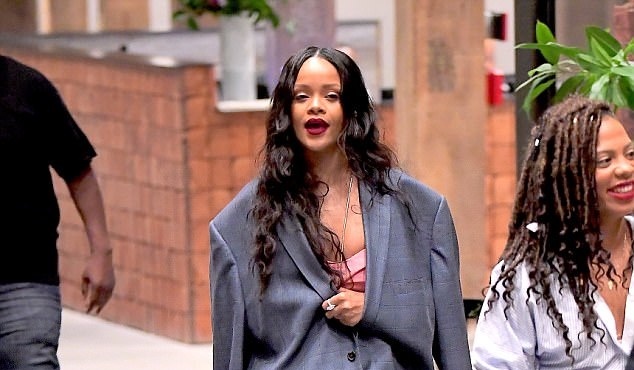 Even though the ‘Fashion Icon of the Decade’ award was handed over to Kendall Jenner, she’s a fashion icon in her own right, plus she’s proven her credibility steering successful fashion collections with Fenty x Puma as well as the highly coveted Fenty beauty launch, so if there’s anyone that knows more than a thing about wearing a perfectly coordinated look, it’s Rihanna. Lately, the singer has been all about monochromatic dressing and it appears it’s her secret for scoring major style points. Stepping out for a dinner on Saturday, the ‘Wild Thoughts’ singer had eyes wandering around her chest in a pink Rosie Assoulin cut-out jumpsuit that generously flaunted her cleavage. What made this look even more eye-catching? RiRi added a pair of strappy heels, furry chain purse, even eyeshadow and a phone case in the same hue. But rather than keeping up with the pink-themed look, as the case may be, she completed with a splash of bold red lips and gold hoop earrings. It’s RiRi, after all.